This detached cottage in the town of South Molton in Devon can sleep two people in one bedroom. 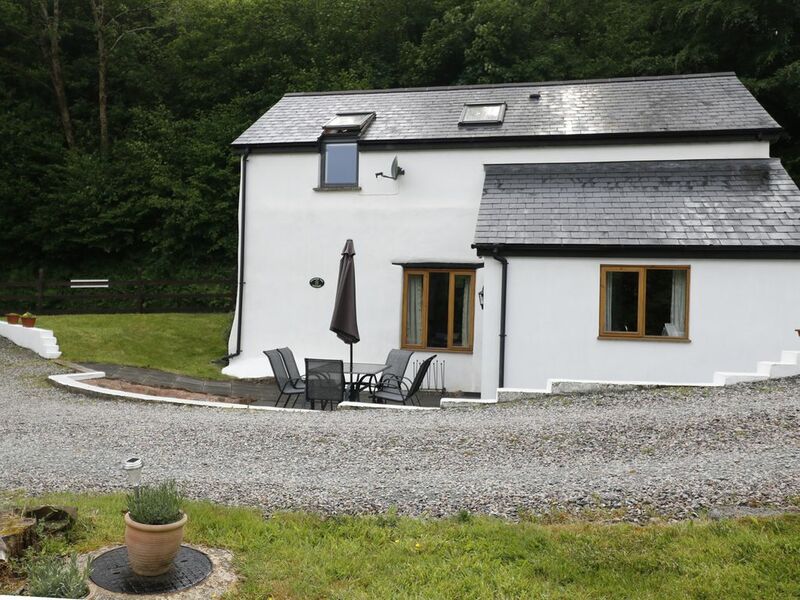 Crooked Oak Cottage is a well appointed property in the market town of South Molton in Devon. Host to a king-size double bedroom and a twin with bunks to sleep up to 6 people. There is a family bathroom, a kitchen and an open-plan sitting and dining area. Outside is ample parking and a paved patio area with garden furniture and gas barbecue. Crooked Oak Cottage is perfect for exploring the English Riviera with the family or friends. Amenities: Gas central heating. Electric oven, ceramic hob, microwave, fridge, dishwasher, TV with DVD player, WiFi. Fuel and power inc. in rent. Bed linen and towels inc. in rent. Cot, highchair, stair gate and toddler chair are available on request. Ample off-road parking. Bike storage. Garden with furniture and gas barbecue. Sorry, no smoking and no pets. Shop 3 miles, pub 1 mile. Note: there is a small charge to be able fish in the river. Note: Please note this property has a check in time of 4pm. Town: The market town of South Molton is known as The Gateway to Exmoor and is ideally placed in North Devon. There is a range of shops, amenities and a weekly market. Being situated not far from both coastal and inland beauty spots it will suit visitors of all tastes. In close proximity are forests, moors, rivers and coast, with churches and other buildings of historical significance. Visit the National Trust's Watersmeet Gorge, Valley of the Rocks and the funicular cliff railway. Further afield, the resorts of Ilfracombe and Combe Martin are well worth a visit, and for some of the best beaches in the country, visit Woolacombe and Saunton and Croyde. Over two floors. Two bedrooms: 1 x king-size double, 1 x twin with children's bunks.Bathroom with bath, shower over, separate shower, basin and WC. Kitchen. Open plan living area with dining and sitting area. Gas central heating. Electric oven, ceramic hob, microwave, fridge, dishwasher, TV with DVD player, WiFi. Fuel and power inc. in rent. Bed linen and towels inc. in rent. Cot, highchair, stair gate and toddler chair are available on request. Ample off-road parking. Bike storage. Garden with furniture and gas barbecue. Sorry, no smoking and no pets. Shop 3 miles, pub 1 mile. Note: there is a small charge to be able fish in the river. Note: Please note this property has a check in time of 4pm.